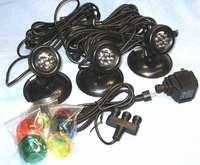 Submersible LED 3-light set with outdoor transformer for your house, driveway, garden or walkways, ponds, fountains. Features: three LED lamps with adjustable positioning, weighted bases, consumes only a fraction of power over normal lights, 12 LEDs per lamp, super bright LED's, high quality water proof housing, for use in or out of water, low voltage, no photocell. Three sets of color lenses, each with: green, blue, red, yellow, clear. From transformer to Tee 6', cord on each light is 16'. Manufacturer warranty one year. Replacement LED RBSLED12 or RBSLED12WW. 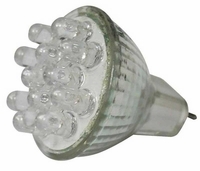 Alpine MR11 LED 12V (volt) AC cool white FTD medium flood bulb/lamp, GU4 bi-pin base, no cover glass. Measures 1-3/8 inches across reflector diameter. LED bulbs use clusters of low powered LEDs to provide decorative, accent or close-range directional lighting. These are not intended to be used as general purpose bulbs. They only serve to accent areas that require a lit up bulb shape or as short-distance directional highlighting of objects.